The world of home automation is an exciting ield that has exploded over the past few years with many new technologies in both the commercial and open source worlds. This book provides a gateway for those interested in learning more about the topic and building their own projects. With the introduction of the Raspberry Pi computer in 2012, a small and powerful tool is now available to the home automation enthusiast, programmer, and electronic hobbyist that allows them to augment their home with sensors and software. Combining the Raspberry Pi with the power of the open source Arduino platform, this book will walk you through several projects for building electronic sensors and introduce you to software that will record this data for later use. 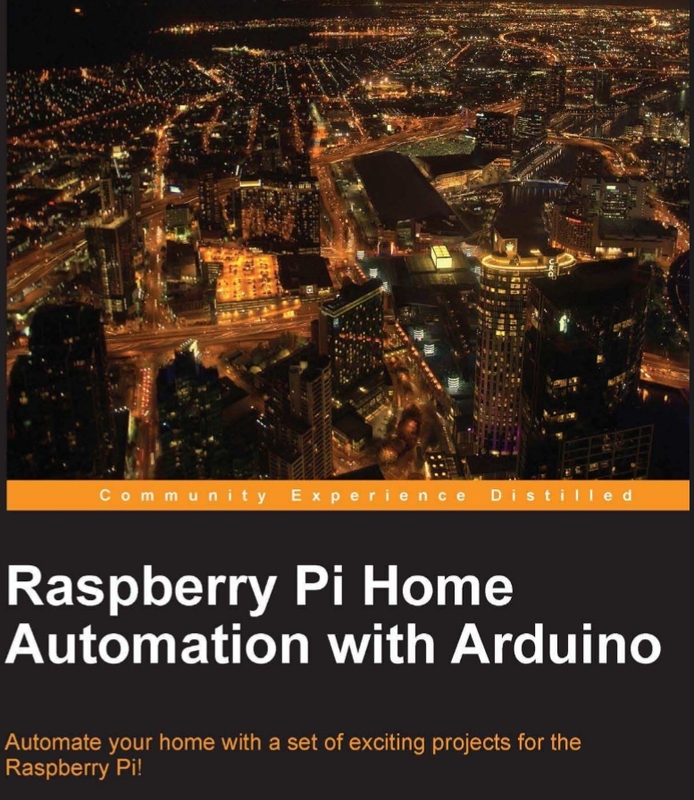 Chapter 1, An Introduction to the Raspberry Pi, Arduino, and Home Automation, introduces you to the technologies used in this book and provides a background to the world of home automation. Getting Started Part 1 – Setting up Your Raspberry Pi, teaches you about the Raspberry Pi and how to set it up, ready to use on your projects. Getting Started Part 2 – Setting up Your Raspberry Pi to Arduino Bridge Shield, provides you with a guide to setting up your Raspberry Pi to Arduino bridge shield and downloading the necessary libraries. Chapter 4, Our First Project – A Basic Thermometer, helps you to build a thermometer and introduces you to a variety of electronic components. From Thermometer to Thermostat – Building upon Our First Project, expands upon our Thermometer project, turning it into a working thermostat that can switch relays on and off. Chapter 6, Temperature Storage – Setting up a Database to Store Your Results, explores storing data output from your Thermostat, and then accessing it via a web browser. Chapter 7, Curtain Automation – Open and Close the Curtains Based on the Ambient Light, teaches you how to integrate motors into your projects for opening and closing blinds and curtains, using the skills learned in previous chapters. Chapter 8, Wrapping up, provides an overview of other technologies you can use in your project and a look towards the future of home automation. Appendix, References, lists a collection of links pointing you towards the resources used in this book and other interesting information. Andrew K. Dennis is an R&D software developer at Prometheus Research. Prometheus Research is a leading provider of integrated data management for research and is the home of HTSQL, an open source navigational query language for RDMS. Andrew has a Diploma in Computing, a BS in Software Engineering, and is currently studying for a second BS in Creative Computing in his spare time. He has over 10 years experience working in the software industry in the UK, Canada, and the USA. This experience includes e-learning courseware development, custom CMS and LMS development, SCORM consultancy, web development in a variety of languages, open source application development, blogging about the integration of web technologies with electronics for home automation, and punching lots of Cat5 cables.